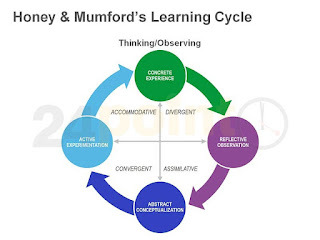 Based on Kolb's work, Honey and Mumford created their own model of learning styles. Rather than being based on the classroom, like many learning styles are, their model was based on the decision making process that managers go through. Their four steps are having, reviewing, and concluding an experience, and planning the next steps. From this they found out that people are activists, reflectors, theorists, or pragmatists. Their model is still widely used among government workers in the UK. If you're interested in learning more about Honey and Mumford's learning styles, you should check out these books. You might also be interested in . . .